We’ve reached the half-way point in our trip and although all of us have been changed in some way, no one more so than Shula. It’s as if she’s been possessed… by a normal cat. At home, she would dive under the bed covers as soon as guests entered the house, not to be seen again until hours after their departure. She continued this paranoid way of looking at the world (or not looking, I suppose) when we began our journey, especially whenever the bus was in motion. It was always Morty who has been our fearless feline, growling and throwing himself against the window whenever a strange animal dared enter his yard. But lately, Shula has acquired balls -- specifically Morty’s. Now, she’s the one who hisses and spits when he gets too close to her. She’s even taken a swipe or two at both her brothers. Tim and I constantly debate about what has brought about this change in her. I believe that a life in motion is making her irritable, (for Shula, is living on the bus akin to being eternally transported in a cat carrier to the vet?). Tim thinks that she’s simply emboldened by the newfound knowledge that if she can survive this, she can survive anything. Predictably, our discussions about the causes of her new behavior get more heated whenever we’re on the road and my bus phobia rears its ugly head. But, I have to concede, he may be right, for the second he starts up the bus, she makes a dive -- not for the bed covers, but for the front seat. 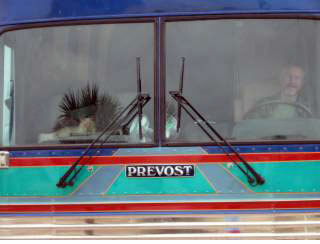 She even remains there most of the day, even when strangers enter the bus. And, if they feel compelled to pet our gorgeous Balinese, she… lets them. Now, I’m not saying she’s particularly happy about it, but she does allow it. Even Morty has noted the change in his sister and rather than taking her on, simply walks away from her outbursts. Perhaps he’s mellowing, which unlike his father, never seemed to be one of his goals for our trip. As for Miles, he still believes the entire world exists to lavish praise and affection on him, a notion only reinforced by our travels. Perhaps the poodle will be the only one unaffected by our adventure. This page contains a single entry from the blog posted on March 7, 2005 3:34 PM. The previous post in this blog was Nick and Me. The next post in this blog is Wonderful Burritos, But the Floor Show Needs Work.